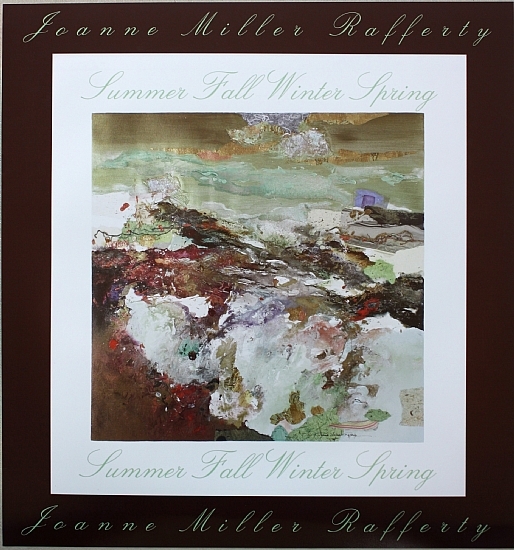 I met Joanne Miller Rafferty about 12 years ago at the New Jersey Center for Visual Arts. We both had an interest in learning to make handmade paper to incorporate into our mixed media artwork. At the time I had no idea the extent of Joanne's art career, but I remember my friend who was also taking the class was simply astounded that an artist of Joanne's caliber and experience was working right along with us... up to her elbows in paper slury! 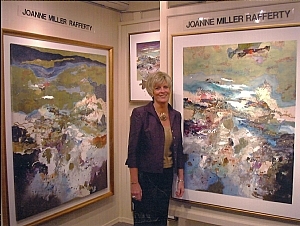 As you'll see from my interview, Joanne Miller Rafferty has been creating fine art for most of her life. She has won just about every award and recognition there is. 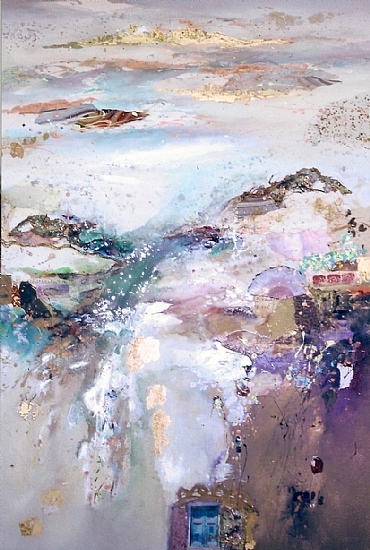 Her work is in thousands of private and corporate collections. Television and movies have incorporated her pieces into their set designs. 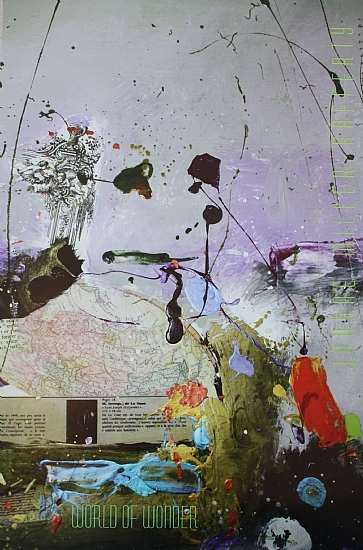 Joanne sells her original pieces and edition gilcee prints throughout the US and is represented by a number of galleries. Since 1990, Joanne has sold over 96,000 prints worldwide. MBS: You've had a long and distinguished career as an artist. Can you tell us a little about your background? How you got started as an artist? Joanne: I truly believe that my "background" always included art in some form. From the earliest time I can remember, I loved to draw and I loved to "make things". When I was in the fifth grade, we had to write a story about our life, and the ending to my story was "I may go to college and study art". And that's exactly what I did. I enjoyed any kind of art project thrown my way in high school and went away to a college known for their art program. After obtaining my Bachelor of Science Degree in Art Education, I became an art teacher on the elementary level, grades K to 6th. I did that for six years, and during that time, took 30 hours of graduate courses in art education, began to paint in watercolor and entered the art festival/craft circuit. My earliest offerings then were small floral watercolors and quotations in calligraphy, that I had perfected in college. My calligraphy professor, Jeanne File, did calligraphy for the Papal offices in Rome and was a perfectionist! My watercolor professor, James Kuo, was internationally recognized and my biggest influence at that time. I won a number of awards in those outdoor shows, and my watercolors began to change into very abstracted forms. There were also landscapes in pen and ink, before beginning to incorporate acrylic into my designs. And my work started to become larger in size. I stopped teaching and started to paint and exhibit full time. I truly loved the outdoor shows and the direct contact I would have with the clients who would actually own my work. The feedback was comparable to nothing else. So different in the gallery business where the gallery owners hear all the accolades! A couple of small businesses saw me at these shows and asked for work on consignment to place in their shops, this is how my first gallery affiliation came about. The owners were always interested in art and were just opening a gallery, so we really started off together. In the next few years , I looked for new opportunities to show my work and entered a very large exhibition at Madison Square Garden. From that show, I was contacted by my first New York Gallery. MBS: I remember one time hearing you say something about those days of making art on your "dining room table" while also teaching and being a mom. There are "so" many women who can relate to that and struggle with it all the time... especially early in their career. Many quit making art as as a result. Looking back on those days, what insights can you pass on to others who are finding themselves relegated to the "dining room table"? Joanne: Luckily, I had finished teaching when my son was born, and then made the transition to painting full time. I think what you are referring to is the story about my painting table (which my husband built for me) that was in the middle of our family room when my children were toddlers. It had two leaves which could be put down on the sides. I had to clear away what I was doing and put the sides down in order to have enough room for the table where we ate our dinner. I think my children grew up thinking that all mothers painted...It was always around them! As far as juggling it all, I was and still am doing what I love. You can always make time for that. I think teaching, painting and having two small children would have been a whole different story, but I was fortunate that my income was adequate enough with the shows at that time that I didn't have to also have an outside job. So my insight would be to not quit, keep doing what you love and you will find a way. Your work has really had a such nice progression, from starting in watercolors to incorporating other mediums and elements. Many artists start with one medium and use it their entire career. What has motivated to you keep pushing and exploring? Joanne: I think it was just a natural progression. I like to keep in touch with other artists and am always looking to what they are doing, as well as seeing current exhibits of interest. The progression to canvas actually happened as an experiment with watercolors on canvas, just to get the general feel of working with that substrate. That is probably why I use acrylics rather than oils because the washes have a watercolor feel to them. As pieces would sell I was motivated to understand what about that piece was desirable to the viewer. I could look at the photo of the piece and pull out certain aspects of what I liked about it. MBS: Do you have favorite materials that you like to incorporate into your pieces? Joanne: Favorite materials keep changing all the time. I love the look of metal leaf, and have incorporated it into my work for quite some time. That is actually how I started creating my jewelry line. 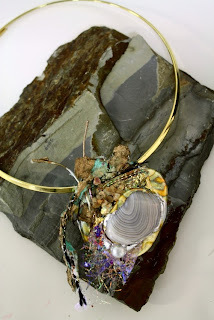 There is so much you can do with variegated colors of gold and silver leaf. After doing a number of workshops in handmade papermaking, I began to add pieces to my work and that has stayed quite constant. Lately I have been adding more textural items: painted fabrics and cording, lace, iridescent particles. MBS: I've noticed inspirational quotes in many of your pieces. Is that something new or have you been doing that for awhile? "The journey of one color vibrating through another and the balancing of light as more and more collage pieces are incorporated into my work makes the concept of the landscape richer, sometimes more complicated, sometimes freer, producing a sense of motion and a place for contemplation. The uncertainty is the adventure; there is a higher vision. Perhaps over the horizon line the vision becomes more clear. Sometimes it only leads to another quest, that not being the final journey. My landscapes challenge traditional boundaries and sometimes give us new ones. Not always referencing specific memories, sometimes incorporating visual shorthand, the collage elements evoke fragments and memories of a universal nature." MBS: Do you work in a particular format? A specific size...large, small...or does it depend on the project? Joanne: The format depends on a number of things. A lot of the time, I like to go with a size that happens to appeal to me at the moment. Of course, if I am doing a commission, I follow the format of what the client is asking. Usually with a commission, they have seen a number of paintings and are asking for certain colorations or a particular size. I have done a number of commissions incorporating collage pieces sent to me by the client. MBS: When you are painting do you start from general idea or theme for a series, or do you find the commonality between pieces after a group of work is completed? I know artists who work both ways. 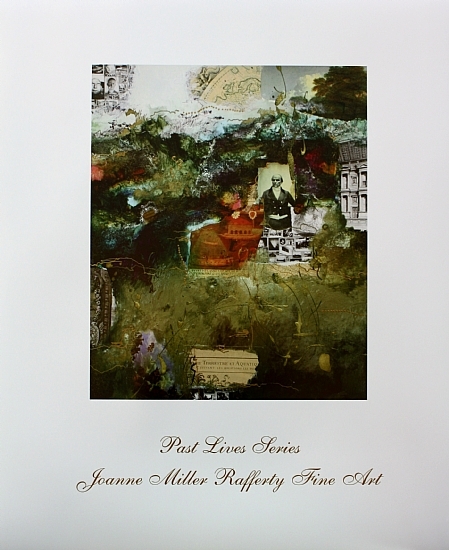 Joanne: I find the commonality of a series usually after the pieces are completed. MBS: For a number of years you've hosted an annual open house in your studio. From a business perspective can you talk a little bit about that. Why you do still do it? How has it effected your networking and visibility as an artist? Joanne: The open house in the studio began when I was doing the art festival circuit. I exhibited in many local shows, so my customers were not too far away. Many of them had called and were looking for a gift at Christmas (this was at the time when I was working in very small formats) so I opened up the studio in early December and had an early Christmas Party, with studio open for sales if desired. When I lived in Maplewood, I was on the Board of the 1978 Art Center and we incorporated an Artist Studio Tour which has been a highlight in the town ever since. People love to see where an artist creates. I have now had my Open House every year since 1973. It is mostly attended by friends and friends of friends. It's a good way to try out new ideas and offer them to those I know. The real business of my art is still handled through the galleries with which I have an affiliation. MBS: You mentioned your gallery affiliations. Where are you represented and what is it that they carry? Is it primarily paintings or do you sell prints as well? Joanne: Some gallery affiliations and representations have changed over the years, but presently those in Richmond (Chasen Galleries), Scottsdale (Rima Fine Art), Lahaina, Maui (Gallerie 505), and New York (Landmark Gallery) are my direct galleries to the public. I am represented by Slaymaker Fine Art in Chicago, that sells my work to other galleries in a number of locations. The galleries only sell my original paintings on canvas and a limited number of giclee prints on canvas, published by Uphouse Fine Art Publishers in Scottsdale. MBS: I saw that you recently opened up a store on Etsy for your jewelry line and also a shop on Zazzle for your beautiful cards and posters. It seems like you have such great representation and visibility already, what prompted you to sell online too? Joanne: They say that one of the best ways to stay in business in any economy is to diversify your income stream. I have had many posters published by Bruce McGaw in New York and Editions Limited in California in the past.. I designed some posters of my own using images from my completed paintings as well as some designs made from portions of completed paintings. I found the designing to be extremely satisfying and used the Zazzle site for my designs. My jewelry line was created a number of years ago but really limited to show openings and friends. Placing my one of a kind work on Etsy has given me a market for this creativity that I wouldn't have had otherwise. Question 11: What is a typical work day for you? Do you keep "hours" and go to work painting like a 9-5 job? Or are you less scheduled about it? Joanne: I definitely do not have a typical work day. No two days are ever the same! If I have a deadline, I probably work the best. Those days I may work all day into the night. Then the next day I may do something totally different. It's nice to also not be working on a deadline, because I can take time to create something totally new. MBS: Looking back over your career is there any advice you have for those who wish to (seriously) pursue an artistic path? Joanne: My only advice would be what I had stated before. You have to be serious about what you are doing and look at every opportunity for others to see your work. With the onset of social networking, there are so many opportunities out there. On Facebook alone, there are artists and galleries and groups to join. You can start a fan page for your work and have friends join that. Linkedin also has artists and artists groups. stores on Zazzle and Etsy.